July 20, 2017 1 comment on "How to Freeze Whole Tomatoes"
My garden did really well this year, and my nine tomato plants produced lots and lots of tomatoes. I canned a lot of homemade salsa, but then started running out of jars, so I decided to freeze some of the extra tomatoes so that I could use them this winter. 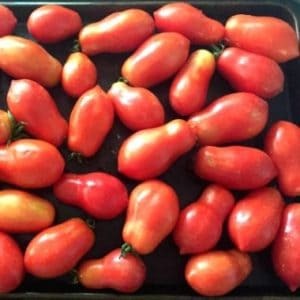 If you have never frozen tomatoes before, it is actually very easy. There are a couple of ways you can do it. The easiest way to freeze them is to just freeze them whole. If you are going to freeze whole tomatoes, there is no need to even peel them first. Just fill your kitchen sink with water and give them a good rinse. Remove any tomatoes that are blemished in any way. You can cut off any bad spots and use those tomatoes right away, but don’t freeze them. Place the washed and dried tomatoes on a cookie sheet and place them in the freezer until they are frozen. It is best to freeze tomatoes that are similar sized together, as they will be easier to store later. After the tomatoes are frozen, remove them from the freezer and place them in gallon sized ziploc bags. If your tomatoes are similar sized, your bags should lay relatively flat and you should be able to stack them on top of each other. Your frozen tomatoes can be stored in the freezer for 6-12 months. When you remove them from the freezer, when they start to thaw you should be able to easily slip the skins of the tomatoes off of them without having to peel them. 1 Comment on "How to Freeze Whole Tomatoes"